As reported, Alphabet has been working on introducing its high-speed fiber internet access service to another three cities in US. 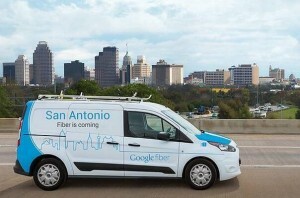 Google fiber had been accessed in six cities in US. Google fiber claims that is currently negotiating with the officers from Oklahoma city,Jacksonville and Tampa city to see if it could provide google fiber service there. Google regrouped the company as Alphabet in order to allow the independence for its subsidiary business. Google fiber is one of the most important business for Alphabet, it offers broad band at 1Gbps. It reaches 100 times than its average broadband speed in US. Google fiber is available in six cities, such as Kansas city, Austin, Provo, San Diego, Louisville and Irvine. According to the statistics from Google fiber’s official website, the reason why Google Fiber choose Oklahoma city,Jacksonville and Tampa city as its next move is they belong to the technical centers in US. “Those developing technical centers have strong enterprise spirit and they promised to offer favors for those small business,”said Jill Szuchmacher, director of launching department of Google fiber. Google fiber costs a lot to explore. Google needs to dig routes and bury the fibers or lay the fibers on telegraph poles. The analyst estimated that it might the average expense for residents to join Google fiber will be $ 500. Google fiber will estimate to see if the local governments wish to limit cost and simplify the administrative licensing before it promises to offer Google fiber service. SHARP released its business performance prediction today. It claimed that the company earnings in the first half of the year is in deficit at $215 million. As the intense competition increasing concern prices in smartphone screen business, SHARP predicted that the company may loss $215 million earnings till September. Its earnings are $ 82.7 million fewer than its prediction. In the meanwhile, SHARP adjusted its 2015 annual earnings from $662 million to $82.7 million. SHARP will release its earnings in the first half of 2015 later this week. It was once the provider of top class screen for Apple. Its leading position was replaced by its rival LG Display. 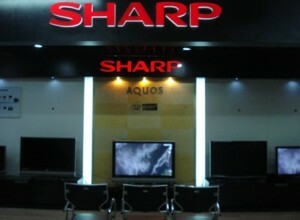 The Critics pointed out SHARP was over investing on its factories’ producing capacity in the past 10 years. There was performance prediction reported last month from SHARP. It suggested that competition in smartphone LED panels became intense and it might fail to reach the performance goal for the first half of the year. In this May, SHARP reported its earnings in 2014. The net loss was $1.86 billion that exceeded its prediction. Soon, SHARP announced its plans to survive from the deficit. On the one hand, it carried out the staff reduction plan, laying off 3,500 employees in Japan. On the other hand, it sold its headquarter buildings in Osaka and the authorization of LED TV in Mexico color tv plants and some American regions. Microsoft released positive earnings on Thursday. Its revenue and profit performed well than expected. But Microsoft claimed that it will cut some more jobs. It did not reveal how many employees will lose their jobs. New York Times reported that Microsoft will lay off about 1,000 employees. Microsoft spokesman stated that the staff reduction plan will be carried out in more departments and countries to fix its business demand. The plan will be taken effect with their deep consideration. To those who get affected by this plan, the company will give them utmost respect. The firm announced the staff reduction plan early this year. It mainly involved in mobile business. Microsoft confirmed the news in the statement gave to New York Times. It admitted that the plan involved in many departments. Microsoft is yet to confirm the exact number of employees that it will lay off. Satya Nadella announced in July,2014 that Microsoft would optimize its service operation and cut 18,000 jobs, accounting for 14% of its total workforce. Then Microsoft laid off some employees unscheduled from 2014 to 2015. 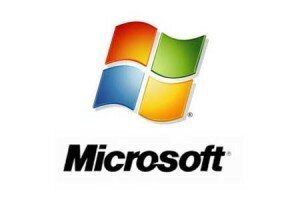 Despite of Microsoft obtained well performance in last quarter, the economic recession in PC market brought adverse effect to Microsoft business. PC market is the important resource of profit for Microsoft for a long time. It adjusted the way of reporting its financial performance in last quarter. Meizu releases its metal handsets in Beijing today, coming with 16GB and 32GB versions. The prices for metal series come respectively as ￥1099 and ￥1299. Metal handsets will be on pre-orders at 16: 30 Beijing time on Meizu website,Tmall flagship store, Qzone and Momo platforms. The 5.5-inch metal has 1080P display screen, 403PPI resolution,Octa-Core Helio X10 processor, 2GB RAM, Flyme 5 OS and 3140mAh. Its camera comes 13 megapixel. Metal supports TF card slot and its storage space can be expanded to 128GB. It supports DSDS and fingerprint identification. Surfing smooth, electricity saved and unheated are its major features. Meizu introduces mobile power pack alongside with metal. It charges ￥149 for its quick charge version and ￥99 for the regular version. The mobile power pack will be on sale at 10 am on October 26 via Meizu official website and Tmall. Meizu applied cost-effective marketing strategy as MIUI did to explore its market share. It gradually marches to high end smartphone market. This is Meizu’s ninth press conference this year. It launched several types of handsets in the past year. The sales volume of Meizu was 5 million units last year. It sold out 8.9 million units in the first half year of the year. Its sales growth increased by 540%. Meizu is anxious to show off. It shortens the release period of new products. The public doubts that Meizu and Alibaba come to Valuation Adjustment Mechanism. Concerning the doubt from the public, Meizu denies this. According to a survey made by Piper Jaffray, suggesting one third American teenagers consider Instagram as the most social network service to share photos, closely followed by Twitter and then Snapchat, burn after redriving instructorng. The fourth went to the application of Facebook. 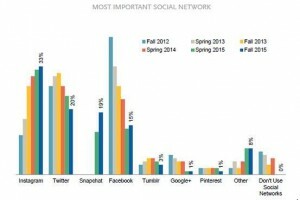 Only 15 % of American teenagers consider Facebook as the most important SNS. It is not exactly bad news to Facebook as it purchased Instagram in 2012. The fact that Facebook became less attractive and popular among teenagers has been discussed since 2013. Facebook gave hint to its investors that there was decline for the application among teenagers at that time. Among the 9,400 interviewees of this survey , they are aging from 13-19, which 56% are males. They are from families that have $68,000 annual average income. There is not much difference between SNS reports and 2015 spring reports, except the popularization of Snapchat exceeds Facebook. Its popular proportion increased from 13% to 19%. The ranking of Twitter is still the same, but its popular proportion declined from 24$ to 20%. It indicates that the application of Facebook has declined among teenagers. They trend to use other social network medias. Facebook was the most popular SNS among teenagers as it described in 2012 fall report, about 42% of the interviewees, while Twitter and Instagram came in third. While a spring report from Pew Research Internet Project indicated that Facebook is the most popular SNS among teenagers aging from 13-17, followed by Instagram and Snapchat. Its report in 2013 suggested that the user growth did not meet its expectation due to the application of teenagers. But teenagers were rarely found to give up using Facebook. A report of interviewing 4,517 teenagers made by Forrester Research last summer, their operating frequency of Facebook was increased compared to the figure in 2013. Amazon officially announced to end the Destinations service which belongs to its subordinate hotel booking service on the other day. This service just has been rolled out for 6 months. Destinations was released in April by Amazon, helping the users for travel planning and booking via Amazon website. Destinations displays the destinations of short trips where the residents live. It offers hotel reservation service, restaurants and resorts information. This service was initially provided in Seattle, New York, and Los Angeles, then expanding to San Francisco and Atlanta. If you visit Destinations website : https://travel.amazon.com/ right now, you will only read the below message: “Destinations will end hotel booking business from October 13, 2015.” Seattle Times reported that the previously reservations of hotel booking are still valid via Destinations. Destinations is not the first traveling app launched by Amazon. Amazon has Amazon Local that provides flash sales which is similar to Groupon service. And the users can seek for discounts concern restaurants and dinners on Amazon Local. Amazon spokesman claimed on Wednesday that the company has learned a lot from this service, and it decided to end Destinations business. Amazon is famous for testing new products in frontiers, and closing down the business when its performance did not meet demand. Amazon had just closed down Webstore for a while, where it helped small business enterprises to build their own online retailed stores. In addition to this, it also ended its Amazon WebPay last year. It might not be good news to the Apple fans as Apple claimed to disable its Apple News service in mainland China. News resources from GSM Arena, Apple has completely disabled the application of Apple News in mainland China. Even though users use those devices made in America, they will have no access to read news via Apple News either. Apple News application on iOS 9 only officially launched in United Stated. Except that users from mainland China and some other countries and regions, the others users do not get affected by this news. They can use the Apple News services as normal. Apple doesn’t explain why it disables the application of Apple News in mainland China. Apparently, Apple directly disables this application might be a simpler way to its technical instead of checking each content inside Apple News application. Apple firm previously disabled some services of its applications, such as it introduced a different version of Apple Maps from the ones in other countries as it uses different data in Chinese version. Users can only obtain the mapping information that have been approved by Chinese government in China via the Chinese Apple Maps, while the mapping information concerns worldwide regions become brief. Instead of using Apple News, you can find some other resources to read international news. No confirmation from Apple when it will re-open this service in China. Jack Dorsey had been appointed as Twitter’s CEO on Monday. One of the reasons that the board of directors selected him as Dorsey is one of the co funders of the company. He will not be afraid of making hard decision but will must to. Dorsey doesn’t have much time to waste as well. According to the informed sources, Twitter is planning to lay off employees next week. It is unclear that how many employees will lost their jobs during this personnel change. Some insider implied that the layoff will be carried out in most of the departments. While laying off the employees, Twitter will also plan to recombine its technical team structure, making it more simplify and effective. Considering its technical staffs account for about half of its total employees, many of them will lose their job during this personnel change. Twitter’s spokesman made statement on Friday and claimed that they won’t make any comment on the rumors and doubts from the public. It is reported that Twitter’s employees grew fast in the current years. It has 4200 employees till June 30, while it only owned 2000 employees in the end of second season of 2013. Its consumers’ growth did not match its employees’ growth. The recombination of the company in comply with the efforts that Dorsey made in the past four months. The company will be more focused. Dorsey expressed the company’s wish to clean up its business sections’ titles when he talked with Re/Code in June. Dorsey recombined product team structure in August. The share price of Twitter rose $0.53, increasing by 1.75%, closing at $30.85 on Friday’s regular trading on NASDAQ securities market. Unfortunately, its share dropped by$0.85, reducing by 2.76%, closing at $30 due to the news of cutting employees in after-hours trading.